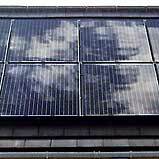 In August 2011 we installed a 2.5kWp, 8 module PV system using Solarworld 250w Mono black panels. These panels look visually appealing due to their black surface and black frame and are ultra slim. This system was positioned on the South East facing roof, with no overshading. Mr G will start receiving the government feed in tariff at a rate of 43.3/kWh for the generation and 3p/kWh for the export tariff, deemed 50% of the amount of electricity generated. 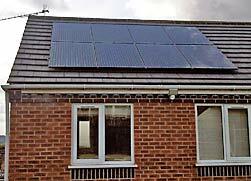 The payback calculation for this system gives an approximate generation and export income for the first year of £921 and an approximate £123 savings from energy used. This gives a total income and savings of £1,044. He will receive guaranteed payments from the Government for 25 years, plus this will be adjusted for inflation using the retail price index. With an assumed annual rate of inflation of 2.5% and an assumed annual increase in energy costs of 2.5% Mr G is expected to receive a combined income and savings over the next 25 years of approximately £32,764.